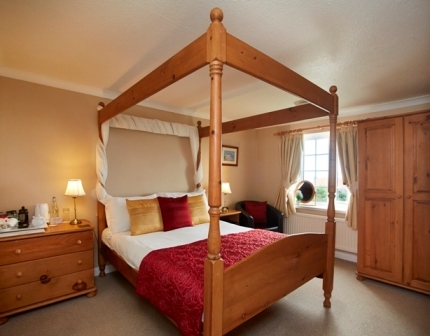 Smugglers Rock is an 8-bedroomed guesthouse set in the heart of the countryside. The house is very old and is not easily adaptable for wheelchair users, although disabled guests who are able to walk short distances and climb one flight of stairs should find the guesthouse accessible as there are no stairs anywhere (except to the bedrooms). • Large print brochure, tariff and access statement are available. • Buses to Scarborough are twice daily (not on Sundays) and are accessed less then 20 metres from the guesthouse. There are no buses to Whitby from Ravenscar. • Scarborough is 10 miles away and Whitby 12 miles away. • Nearest equipment hire is in Scarborough. • There is a Radar toilet situated in Ravenscar (1/2 mile away) from the guesthouse. • We have an off-road gravelled car park at the back of the house with 12 parking spaces. It is a short flat walk on a tarmaced road to the front of the house with no kerbs. Cars can be parked temporarily at the entrance to the guesthouse to unload/load luggage. • Entry on arrival is by pressing the front door bell. Our telephone number is also on the front door. • Luggage can be taken from/to vehicles on arrival/departure. • We have only one entrance to the guesthouse. There are no steps involved on the path leading up to the door and only the threshold to cross. The standard size door is hinged on the right hand side and opens inwards. There is a large carpet mat directly inside the main door. The whole guesthouse is non-smoking. • There is a chair in the hallway. • The whole area is carpeted and lit at both ends with a lamp on the reception desk and on the table at the bottom of the stairs, as well as two ceiling lights. • Large print registration forms, tariff and invoices are available. • The hallway has doors opening inwards to the breakfast room and guests' lounge, and two further private doors. • There is someone on the premises most of the time (and always during the night). • We have no lifts on the premises - there is one flight of stairs with a handrail on the left hand side leading to six of the bedrooms. • There is a further flight of stairs with a handrail on the right hand side leading to the two second floor bedrooms. The stairs and landings are carpeted and the lighting is uniform in these areas with emergency lighting present in the hallway and landings. • The guests' lounge is on the ground floor, is carpeted and has a range of settees and easy chairs with two coffee tables. There is one rug in front of the fireplace. • The lounge is non-smoking. • There is no toilet in the public area. • The breakfast room is carpeted and well lit with well spaced tables at normal height. None of the chairs have arms and some of the tables have a central bar across near the floor. 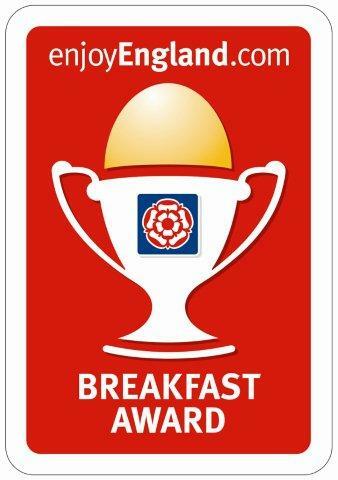 • Breakfast menus and breakfast order forms are available in a large print and special diets can be catered for. • The breakfast room is non-smoking. • We have picnic tables at the front of the house on the lawn. Access is relatively level via either the tarmac road, or the grassed area, with no steps involved. • There are security lights at points around the building, as well as sensor lights in the car parking area. There are also fixed coach lights on the corner and side of the house leading to the entrance, and by the front door. • Unfortunately, none of our bedrooms are suitable for wheelchair users as they are all at first and second floor level. • All our bedrooms are carpeted with contrasting plain walls. • All the colour televisions are remote control with teletext and freeview. • We have cordless kettles, all of which have water level indicators. • We have no facilities for pets in the bedrooms and all our bedrooms are non-smoking with smoke alarms and alarm sounders fitted. • All our bedrooms have en-suite shower rooms with laminate or lino flooring and tiled walls. All the bathroom doors open inwards (apart from the single room on the first floor which has a sliding door). The shower trays are all standard height from the floor and have thermostatic mixer valves with the removable shower head on a sliding rail. • Our Caravan Club CL is on a slightly sloping lawned area. We have 2 fresh water points and one chemical disposal point. • We have picnic benches available for use at the front of the house which has fairly level access to it over grass. • We also have picnic benches at the back of the guesthouse and there is level access to them through the gravelled car park and onto the grass. • The guesthouse is totally non-smoking. • We are able to store medications/dietary foods/baby foods etc. in our fridge. • Hours of operation: Normal check-in times between 4pm and 6pm, although the premises are usually occupied 24 hours a day and always at night. • Local accessible taxi numbers: Scarborough - Beeline Taxis 01723 366666, Nippy Taxis 01723 377377, Station Taxis 01723 366366. There are three self contained cottages at Smugglers Rock Guesthouse and Cottages. Smugglers Rock and Smugglers Cove are of standard layout with lounge and kitchen/diner downstairs and bathroom with two bedrooms upstairs. Smugglers View has the kitchen/diner, shower room and two bedrooms downstairs and the lounge upstairs. • Buses to Scarborough are four times daily (not on Sundays) and are accessed less than 20 metres away from the cottages. There are no buses to Whitby from Ravenscar. • Scarborough is 10 miles away and Whitby is 12 miles away. • The nearest equipment hire is Scarborough. • There is a Radar toilet situated in Ravenscar (1/2 mile away) from the cottages. 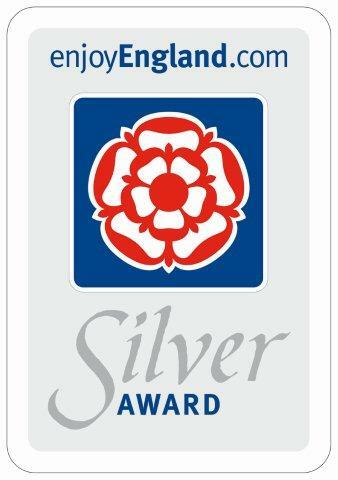 • We have an off-road gravelled car park at the back of the cottages with 12 parking spaces. It is a short flat walk on a tarmaced road with no kerbs to the front of the building where Smugglers View cottage is located. There is a gently sloping stone path to the cottage door. Cars can be temporarily parked in the lane at the front of the cottage for loading/unloading. The entrance to Smugglers Rock and Smugglers Cove cottages is either from the tarmaced road at the side of the house or via a level stone path from the car park. Luggage can be taken from/to vehicles on arrival/departure. There are sensor security lights in the car park and fixed coach lights on the corner and side of the building and by the entrance to Smugglers View cottage. • The entrance to all three cottages is over a high threshhold only directly into the kitchen. Smugglers Rock and Smugglers Cove also have access to the vestibules at the front of the cottages, again via a high threshhold only. All three cottages have 2'6" entrance doors opening inwards and the internal doors are either 2'6" or 2'3" wide with all doors opening inwards to bedrooms and bathrooms. • The lounge in Smugglers Rock cottage is accessed either from the vestibule or from the kitchen. There is a standard staircase with two turns and a handrail all the way up. Smugglers Cove cottage has a wide spiral staircase with handrails on both sides. Smugglers View cottage has a standard staircase with one turn and a handrail on one side. • A washing machine is provided in the kitchen of all three cottages and a drying rack/clothes horse. Smugglers Rock and Cove cottages have access to an outdoor wasing line in the communal garden. • We have picnic tables at the front of the house for guesthouse and cottage guests to use. In the communal garden area of Smugglers Rock and Cove cottages, we have a picnic bench and wooden table and chairs outside on a paved/gravelled area as well as two wooden benches. Smugglers View cottage has a wooden table, two benches and two chairs in the private patio area. There are also individual pvc chairs for the use of cottage guests. There is a lawned area specifically for Smugglers Rock and Smugglers Cove cottages adjacent to the patio area. All of the garden and grounds are level. • Smugglers View cottage has two ground floor carpeted bedrooms, one with a four poster bed and one with 2'6" single beds. There is a central light and bedside lamps in each bedroom. All lamps have in-line switches. 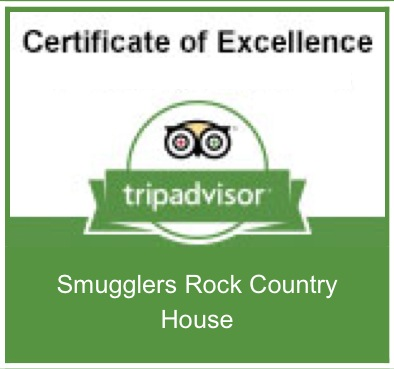 • Smugglers Rock and Smugglers Cove cottages each have two carpeted upstairs bedrooms - one double bedded room and one twin bedded (2 x 2'6" beds) room. All have bedside tables and lamps with in-line switches. • The bathrooms in Smugglers Rock and Smugglers Cove are on the first floor. The bathrooms have tiled laminate floors, wc, basin and a corner shower unit with power shower. • Smugglers View cottage has the bathroom on the ground floor. It has a lino floor, wc, basin and a power shower in a cubicle. 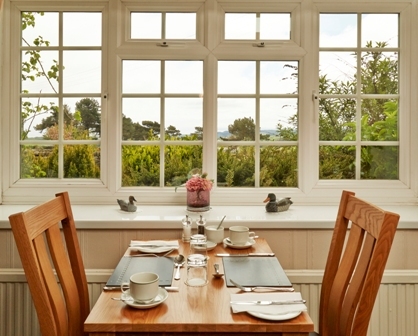 • All three cottages have their own ground floor kitchen with outside access. There is a door from each kitchen to the rest of the cottage. The sinks have mixer taps and all the floor and wall units and worktops are standard height. Smugglers Rock and Smugglers Cove have freestanding electric cookers with solid hotplates. All three cottages have microwaves on top of the fridge/freezer (apx. 120cm high), and the kitchens are lit by a set of central spotlights. All three cottages have ceramic tiled floors. • Our Caravan Club CL is on a slightly sloping lawned area, accessed through the gravelled car park area. We have 2 fresh water points and one chemical disposal point. There is electricity provided for all 5 pitches. • We have picnic benches outside the cottages on a paved/gravelled area. There are also individual pvc chairs. There is a lawned area specifically for the cottages adjacent to the patio area. All of the garden and grounds are level. • All three cottages are non-smoking although guests are able to smoke in the grounds. 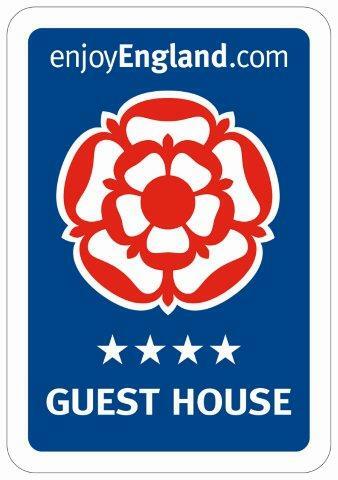 • Hours of operation: Normal check in times for the cottages is from 4pm on a Saturday, although the premises are usually occupied 24 hours a day. • Local accessible taxi numbers: Scarborough - Nippy Taxis 01723 377377. Station Taxis 01723 366366.